We had a little visitor at our house yesterday. My husband took these pictures so I can't take credit. 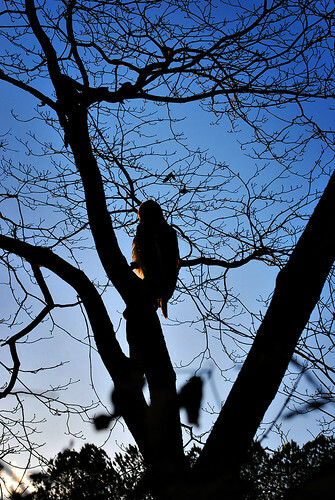 The injured hawk started out in the neighbors tree and then settled down next to the house for the night. 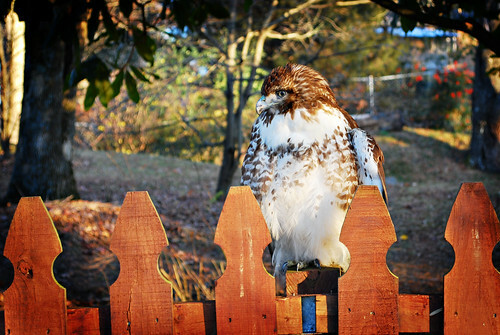 He was perched up on our fence this morning. I hope that he will be ok. My husband contacted the Wildlife Resource Agency so hopefully they will come get him and nurse him back to health. I am making this last shot my Best Shot. I can't believe how close my husband got to the hawk. Holy cow! Hope he's better soon. It's such a beautiful animal. Wow! what an unexpected treat -- gorgeous bird. What a magnificent bird and a great shot. Hope he recovers. That is an incredible shot! Hawks are so regal looking. Hopefully the Wildlife Resource Agency will get there soon and helps him. Again, incredible shot. We have many around our home and I love to see them soaring above us. OMG! That must have been a wonderful sight. He really is beautiful. I am glad you guys made the call. Wow! Great photos! I hope the little guy is going to be ok! That's an amazing capture, kudos to your husband. Wow! Those shots are amazing! How incredible to get such an up close and personal experience with such a beautiful creature! I hope he does well. Your hubby is quite the photographer, too. What abeautiful bird, and great shot too. Lovely blog photos all round. Wow...that is a gorgeous bird and those pictures are great!! props to your hubby on these! :) Hope the hawk is ok now!